Fair. This is a new and revised edition dated May 1950. No dust jacket. Significant foxing/tanning to edges and/or ends. Mint in Very Good jacket. 8vo. Jacket has some light wear and rubbing to rear, otherwise sound. PP mint. Fair. B000WQWM3A reference markings inside book, dust jacket is in tatty condition. Very Good. Hidden Teaching Beyond Yoga by Brunton, Paul. 413 p.
Good. 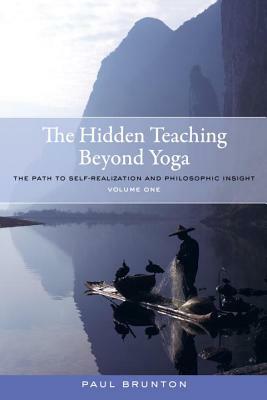 Hidden Teaching Beyond Yoga by Brunton, Paul. 413 p.
What's written in this book will soon be accepted by more and more people as science gradually explains in a more popular fashion the ramifications and how they effect everyone's life. Brunton explains the true nature of reality, and no, people won't like it, they will find it difficult to accept. However, if you take the trouble to read with an open mind you will see the truth of it all, as he takes considerable trouble to go through the concept step by step. If you can get your head around mentalism it will open up a whole new world of understanding so many problematic ideas that was in no way possible previously.